Mining Ventilation Software | Ohio Automation Inc. The ICAMPS MineVent and MineVent 3D are mining ventilation software modules using expanded versions of the Hardy Cross Method for calculations. It also has a more robust second calculation engine called the Gradient Method. As-mined and projected timing maps serve as the basis for drawing to-scale mine ventilation schematic diagrams. 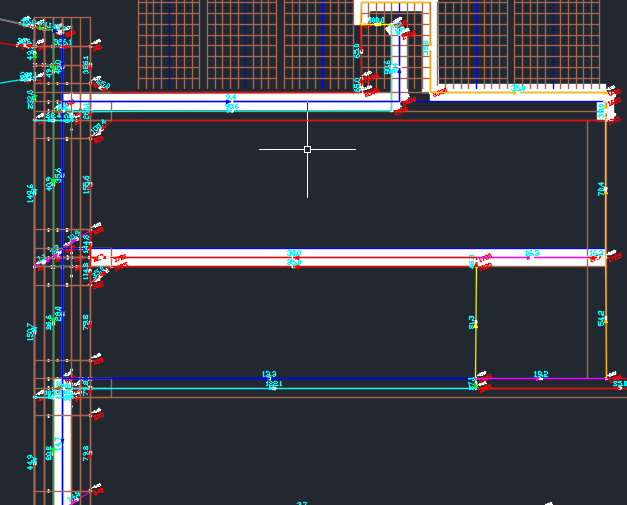 Using AutoCAD snap features the planner designates nodes in the ventilation network. Except for the atmospheric nodes, each node must be assigned a unique number. The system prevents duplicate node numbers. The user connects the nodes with polylines which represent the actual branch airway path. The branch must have a start node and end node but you can have dummy nodes in between so that the actual branch path is used and the branch length can be calculated for use in the resistance formulas (see figure below). The branch length can also be typed in manually when calculating resistances. Each branch polyline has an associated attribute block that contains airway properties. Since the ventilation schematic is drawn to scale, the system can automatically compute the branch length and use the airway characteristics to calculate the branch resistance. The system has many features to simplify editing schematics and enhancing the ventilation diagram. All changes to a schematic drawing are stored permanently. Allows for a tolerance or correction factor so you have some idea how accurate the results are. For example 100 cfm, 10 cfm, 1 cfm etc.. Calculate Resistance 10 different formulas. With special formulas and treatment of Leakage Branches (Stoppings Formula) and Regulators. Resistance formulas for Non-EQ in Parallel, Pressure and Quantity for one branch, the option to read from a survey file Pressure and Quantity formula. Export and import general MineVent data. Import from some other program to save you time. 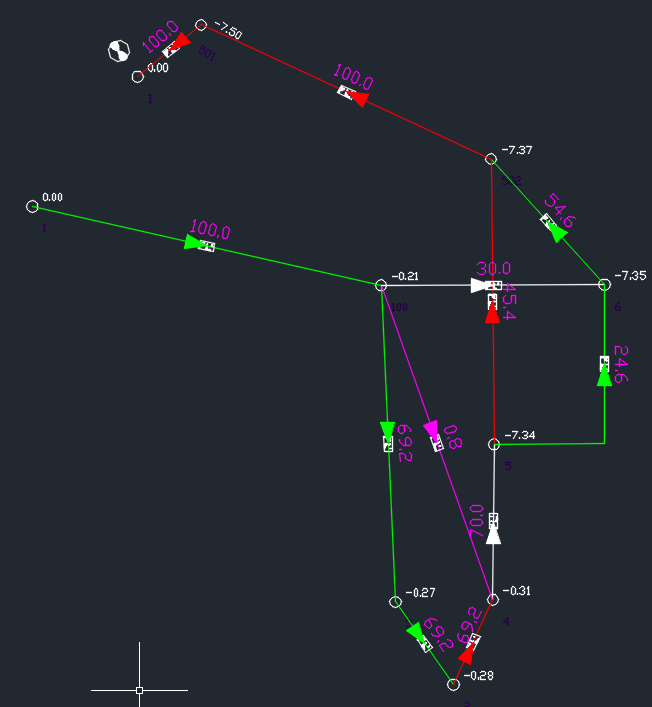 Move/Stretch branches to lengthen or shorten a selection around a closed polygon. 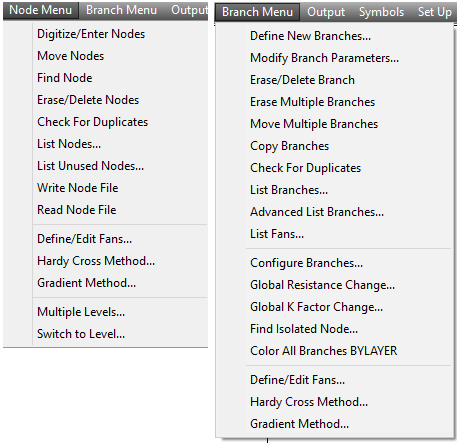 Configure Branches which allows to set up layers for branch colors, linetypes, resistance data defaults all by code. Tabulate the Quantities by code after the simulation is run. Draw Quan/Pressure can set the decimal precision. You can move the numbers around using AutoCAD or Edit Schematic. List Compare Quantities. For example you may want to see what the affect is of changing some fan, branch resistance, regulator etc... This will color up the drawing with your selection of polyline width and the percent change you want to see. Also tells the ventilation cost of the change. 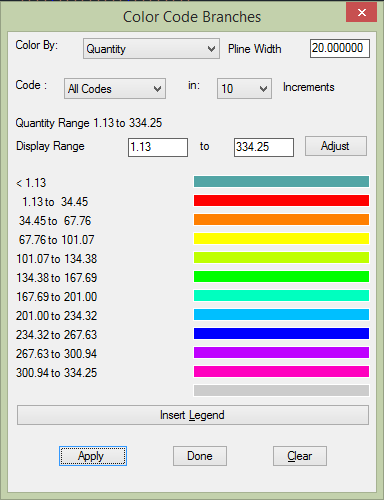 Color By allows you to also set a polyline width and color by quantity, resistance, NVP, code and more. Merging Networks, in case two users want to work on different parts of the map then combine. Likely other uses. The program has many helpful features for modifying the branches on the drawing or in List Branches where you can filter the branches you want to view and or edit. You may sort by any parameter in the list ascending on first click the descending on the second. To sort by more than one sort by the Primary Last. 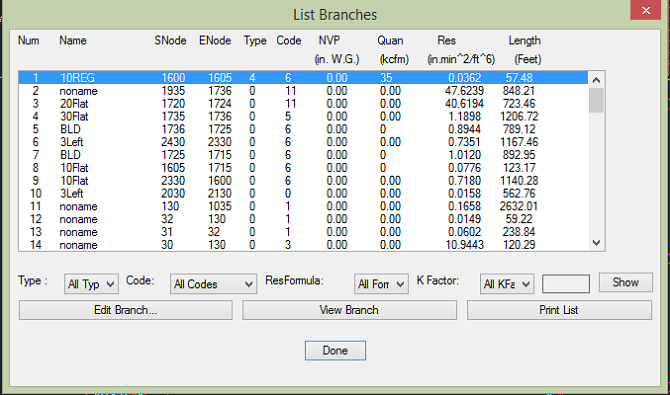 The Advanced List Branches allows you to edit Branch information in form view with drop-down boxes and edit in place where appropriate. The lighter shade of green indicates values that cannot be changed in the list either because they are calculated or not valid for the branch type. The above is sorted by branch type descending. The Define/Edit Fans allows you to move through the fan curves in a fan file and define new ones. You can choose a New Curve or a Modified Curve, which allows you to create an equivalent fan curve from 1 or 2 existing curves (UNEQ Series, UNEQ Parallel, EQ Series, EQ Parallel, or a Speed Density change). Other options are the Copy/Paste fan curve data, Show the Curve, List all the curves in the file and set the efficiency numbers for cost calculations. You can show the fan curve graphically with the operating point in red as shown above. Hovering over a point shows information about the point and curve. There are options to show cross hairs, zoom in and zoom out and more. The top always shows shows the curve number, name and blade setting. 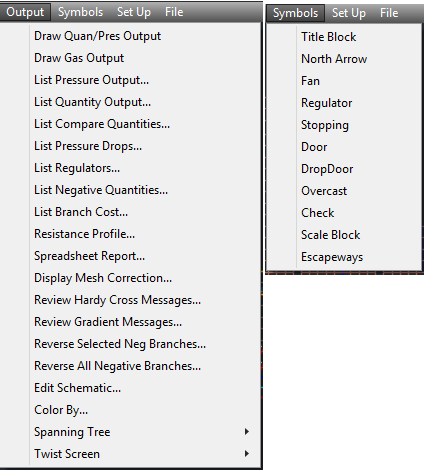 Above are the main input menus for MineVent as well as the two different calculation engines Hardy Cross and Gradient. The Gradient has better convergence and is more efficient as far as how many iterations it takes to converge. The Hrady Cross is overall faster. It is useful to try both on the same model for various reasons. Above are the main Output menus for MineVent. The most popular are Draw Quan/Pres Output, List Compare Quantities, List Negative Quantites, Edit Schematic and Color By. 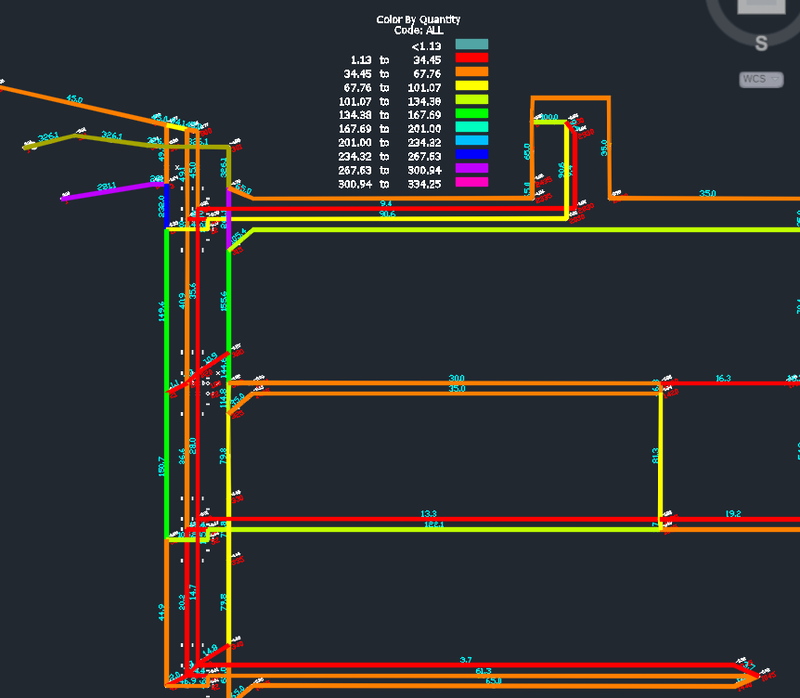 Output consists of color coded schematics diagrams with branch quantities and node pressures displayed as shown below. The schematic can be plotted separately or superimposed on mine maps. The output also includes information for setting regulators. If the network analysis program (Hardy Cross or Gradient) yields unsatisfactory results or fails to converge, the system has numerous diagnostic features to help the user correct the schematic. The system has features that let the engineer highlight problem areas of the ventilation schematic based on the output. The above is a sample of a Ventilation Schematic showing how it post the Airflow (kcfm in Magenta) on the airways and the pressures (in. w.g. white).on the nodes. If you are working in Imperial units, otherwise it is m^3/s and kPa. You can of course cahnge the sizes on the numbers and the colors. The above is just a sample to show results and is not any kind of reasonable mine ventilation plan. The above is how you use the branch Code for cosmetic purposes and designate the layers (MVC01-MVC12). 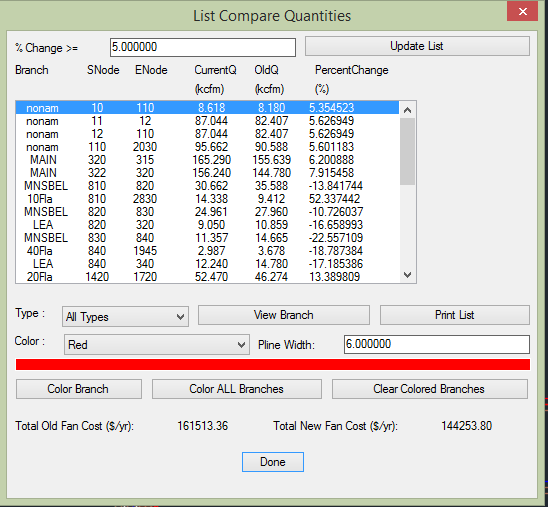 When defining or editing a branch you can assign or change the code which will affect the colors, layers, linetype and default resistance data for that branch. The nice thing is that you can just change the color, and linetype here and all the branches in the drawing will be updated. You can also use the AutoCAD layer command. The List Compare Quantities shows what happens on two consecutive runs if you change something. The above is the result in DemoMine.dwg by just changing 2 Limit Quantity branches. You can change the precent change line width, color etc.. It also shows the difference in fan cost at the bottom for whatever change you made to the schematic. If you color it on the drawing you get the below. The above was colored for a change of 20 percent and colored white the branches that changed by 20 percent or more with a line thickness of 100. The above shows the dialog interface for coloring by parameters Quantity, Air Horse Power, Gas, Resistance, Natural Ventilation Pressure, and Pressure Drop. The above shows a powerful way to change all or a group of branch resistances. You could also use the SURVEYED formula to change the resistances based on survey data from a file.